Lunar eclipse: The Blood Moon of April 2014. 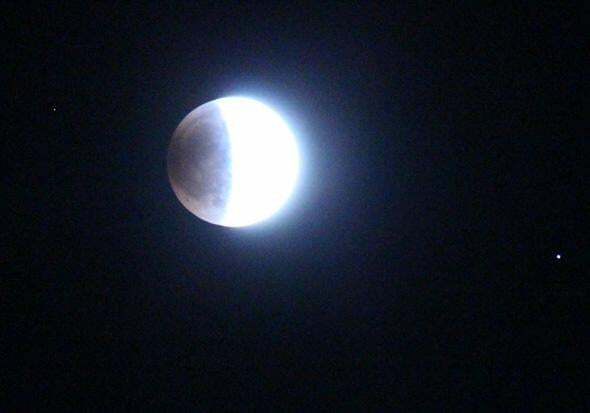 The lunar eclipse, just minutes after totality started. The color is due to sunlight filtered through Earth’s atmosphere before lighting up the Moon; in essense, all the sunrises and sunsets on Earth illuminating the Moon simultaneously. 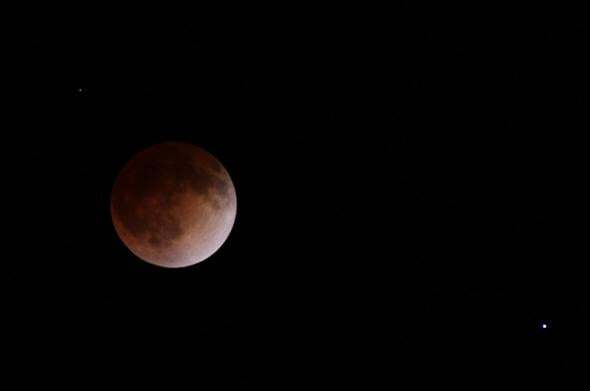 Did you watch the total lunar eclipse last night? Judging from my Twitter feed, a lot of people did! Chatter and pictures were flying around the ‘Net as the silvery full Moon slowly drifted into the Earth’s shadow and turned a lovely shade of orange. I took the picture above at about 07:21 UTC (01:21 Mountain time, local for me), about 15 minutes after the total phase started. You can see the bright star Spica (the brightest star in the constellation of Virgo) just to the Moon’s lower right, and the much fainter star h Virginis just above and to the left of the Moon. It was fun to see fainter and fainter stars pop up as the Moon faded away, its bright glow no longer capable of washing them away. I suggest making it big, if not full screen, and make sure you have the volume up for the first few seconds. The coyotes really set the mood, didn’t they? Even though I was freezing my toes and fingers off, it was truly a wonderful and fun evening. I’ve seen a dozen or more total lunar eclipses, and I think my favorite part of this one was sharing my photos on Twitter in near real time. People all over the world were excited to see it, and that is a big part of why I do this. A little over half an hour into the eclipse, a longer exposure reveals details on the shadowed part of the Moon. Due to the complex and subtle dance of gravity and geometry, there will be three more total lunar eclipses visible to the United States over the next year and half: in October this year, and in April and September of 2015. While there won’t be any bright stars near the Moon for the eclipse in October, the planet Uranus will be only a degree away! That’ll make for some nice family portraits. And there’s also a partial solar eclipse two weeks later, on Oct. 23, 2014, too! That’ll be a treat. And if you live in Australia there’s a nice annular solar eclipse on April 29; this is when the Moon is slightly smaller than the Sun and leaves a ring of Sun around the dark Moon. There was one of these last year and there were some fantastic pictures and video. I hope we’ll get more. Remember: Look up! There are always amazing things to see.